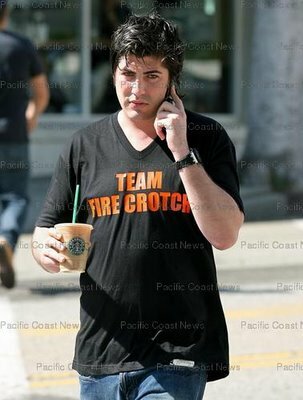 So does Lohan have a t-shirt that says "Team Greaseball"? god, he is so goddamned repulsive! How does he manage to always look so GREASY? Does he apply grease to his face, hair and body? I can just imagine what he must smell like! Oh, now I feel like throwing up. Who is this guy? Elvis? going in 2 different directions?